Over the years, our clients have asked a lot of questions about various things, from the specifics of garage installation to how garage door openers work. 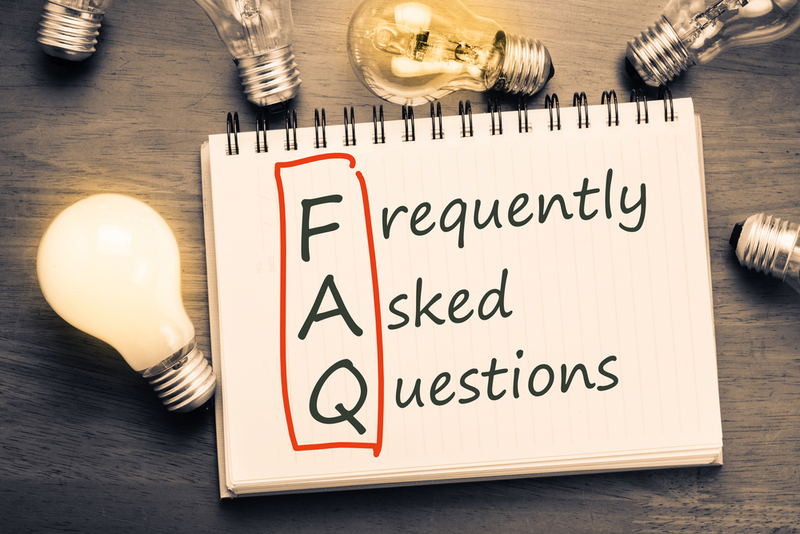 We thought we would share with you some of the most frequently asked questions in hopes that it might answer some of the questions you may have about who we are, what we do, and what you can expect when you get our Expert help. Old springs that have the wrong tension. Nuts and bolts that have come loose. Old nylon rollers that have lost their lubrication. Hinges that have been worn out. A faulty or old motor. One of our qualified specialists can easily diagnose and fix any of these causes. If One of the Panels Is Damaged, Do I Need to Replace the Whole Door? This question is a bit tricky to answer because it depends on a few things, including the kind of door you have and the damage that it sustained. After inspecting a garage door, one of our team members will be able to determine whether only one panel should be replaced or if the whole door will need to be replaced. What Do I Do If My Garage Door Falls Off of Its Track? The best thing to do is to leave it alone and call a professional. Garage doors can be very dangerous, especially for people who are trying to repair them without much experience. If your garage door falls off of its track, we will be able to repair it so it can once again be safely operated. Can I Fix My Garage Door Myself? A garage’s R-value refers to its insulating ability. Because garages are usually large, not heated and made of concrete, they often tend to get quite cold in the winter and hot in the summer. A garage door with a high R-value will help keep the garage at a more constant temperature throughout the year, which can help to prevent damage to items that are being stored inside the garage. If you are going to be spending a lot of time in your garage, you might want to consider investing in a garage door with a high R-value as well. How Can I Find Out If My Garage Door Is Out-of-Balance? Pull on the emergency release lever located near the garage door opener. This will allow the door to roll freely up and down the track. Lift the garage door until it is half-way open. Let go. If your door moves more than a little bit, it will need to be re-balanced. *Please do not attempt to repair or replace your garage door’s springs by yourself, as it can be dangerous. Contact a professional for help repairing or replacing your garage door’s springs. We have repaired and replaced thousands of garage door springs and would be happy to help you repair or replace yours. Why Does My Garage Door Reverse When I Try to Close It? When this happens, it is likely because there is something in the path of your garage door or its safety sensors need to be repaired or adjusted. Check to see if there is anything near the path of your garage door that might trigger the safety sensors. If there is nothing there, check to see if the sensors are facing each other and have not been knocked loose. Once they are facing each other, take a look at the LED lights on the component. If it is flashing or dim, it is likely that the sensors are not properly aligned. Wipe off the glass on the sensor. Sometimes when they get dirty or dusty, the sensors malfunction. If you still have a problem, call us and we will gladly come diagnose and fix the problem for you.